There is just one Train station in Marrakech and just one train line into and out of the city.Trains from Marrakech operate to towns and cities north of the city. These include Casablanca, Rabat, Fes and Tanger. The Marrakech trains are fairly comfortable. They offer 2nd class and 1st class carriages. We recommend buying 1st class train tickets because they are only a few dirham or so more than the 2nd class tickets. The 1st class carriages offer that little bit extra level of comfort. Bigger and more comfortable seats are the main advantages of travelling first class on Marrakech Trains. Train tickets in Morocco cannot be purchased outside of the country. However, you can buy train tickets for any journey at any Train station in Morocco. Although at most times of the year it is not required to purchase your Train tickets in advance, we usually recommend that you buy them at least the day before your journey, if possible. This avoids any last minute panics if you are wanting to travel at an unusually busy time period or if you forgot about some public holiday. Marrakech Train station itself is a really modern building, housing not only the Train Platforms but also a range of Restaurants, Cafés and shops. The most notable and recognisable food outlet at Marrakech Train station is good old McDonald’s. It has both indoor seating and a nice area outside where you can enjoy your Big Mac Arabia and people watch at the same time. The outdoor area is not usually affected by traffic noise from the street as the road is set back away from the train station. Security guards patrol the area so that you are not usually bothered by unwanted attention. One other Restaurant / Cafe Marrakech Train Station, which we have tried and tested. (it was so good, we tested a few times!) This is Les Terrasses de la Gare. Located upstairs in the Train station. 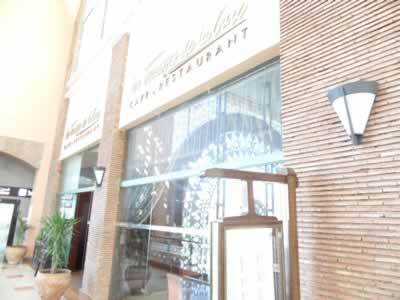 The Restaurant serves a good menu and has an indoor seating area. 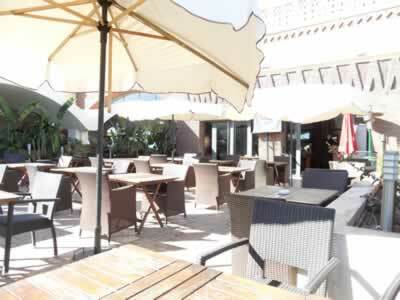 There is also a very large outdoor terrace seating area, equipped with Large Parasols and great views of the surrounding city. Full timetables for Marrakech Trains, including prices and journey lengths can be found at http://www.oncf.ma The site is in French, although it is very easy to understand and navigate. Alongside Marrakech Train Station, you will find the Supratours Bus station (also owned by ONCF), which is very helpful if you are arriving into Marrakech by train and immediately needing to travel onwards to another city further South. Note that trains don’t go further south than Marrakech and there are no trains to Agadir or Essaouira. If you are needing a Hotel to stay at, which is located very near to the Train Station, then we recommend that you try Red Hotel, which is a great 3 star hotel directly opposite Marrakech Train Station. The Hotel has great, modern Rooms and also has access to the adjacent 4 star Hotel’s very large and comfortable indoor Swimming pool with Pool Bar. Alternatively, The Ibis Hotel is also located a very short walk around the side of the Train Station building (towards the Supratours bus station) and this Hotel has an outdoor Swimming pool. Both Hotels are very well located for Marrakech Train Station and Supratours buses.